Most of my Xreid journey was shared with others, but the sunset was mine alone. To the west, the spiky peaks of central Jotunheimen stood like a jagged row of teeth, silhouetted in the orangey glow of the last light of the sun. To the east, rolling hills extended towards Beitostølen, my final destination, which I hoped to reach sometime tomorrow. A pink glow shimmered on the horizon, and the yellowy full moon rose. I forgot all about the race, about the fact that I was in 2nd place, chasing 1st place into the long twilight of a Norwegian summer night. For the first time in nearly 12 hours, for just a moment, my single-minded focus on forward motion drifted, and I stood still, admiring the landscape around me. climb in the race and at 2068 meters the high point of Xreid 2018. 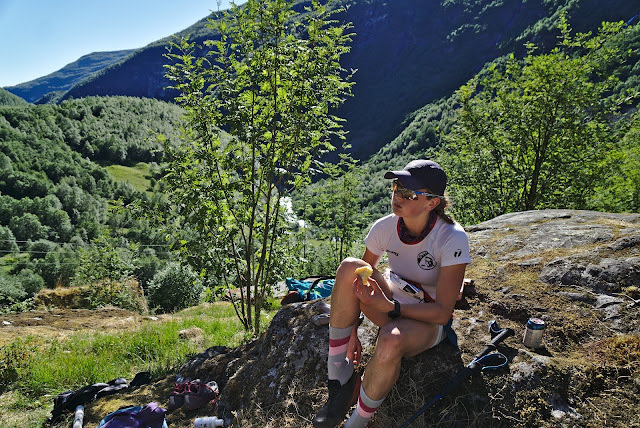 I had found a steady groove, was already snacking on brownies, and trying to ignore the competitive drive that filled me when my friend Ivar told me I was 3rd woman. My eyes were on the ground, focused on the rocky trail in front of me. “Turn around and look at the view,” urged Tom, a racer I had met on the long, social bus ride to the race’s start at Turtagrø. I turned, and took in a tumble of glaciers and the majestic Hurrungane mountains that rose behind us. This is what we came for, I thought. I passed over the peak of Fannaråken in good spirits and proceeding cautiously on the downhill, not wanting to twist an ankle on the rough trail. 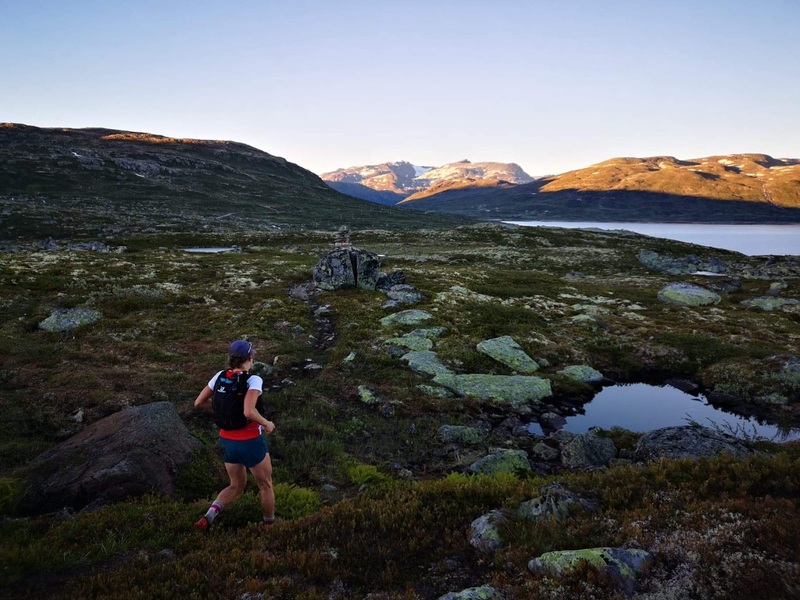 As I ran towards Utladalen valley, I was passed by several racers, and stubbed my toes on rocks several times. 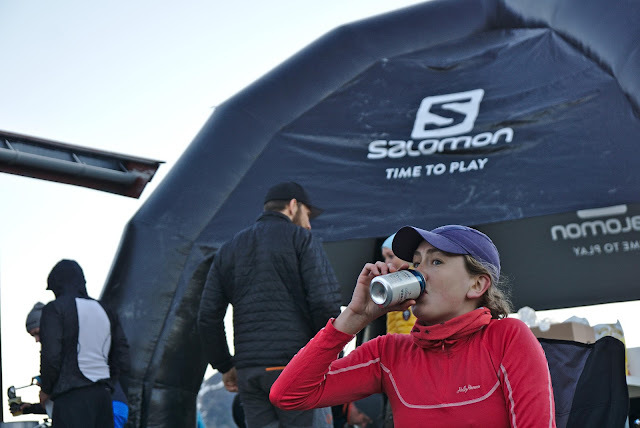 My self-confidence floundered; usually I’m a decent downhiller – what was wrong today? One thing was for sure, it was dead hot. 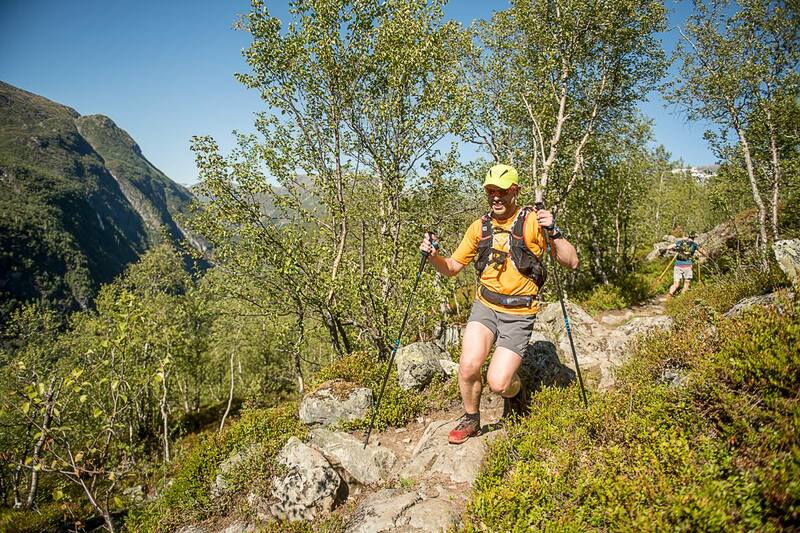 When Sindre, the camera man from Ecotrail, passed me, I was reminded I had a handkerchief in my pack and started wetting it and my baseball cap in streams. It was a relief to pass by Skogadalsbøen hut, even if it meant the start of another climb, just because the landmark represented progress. Rule #1 was never think about the whole distance I had to cover. 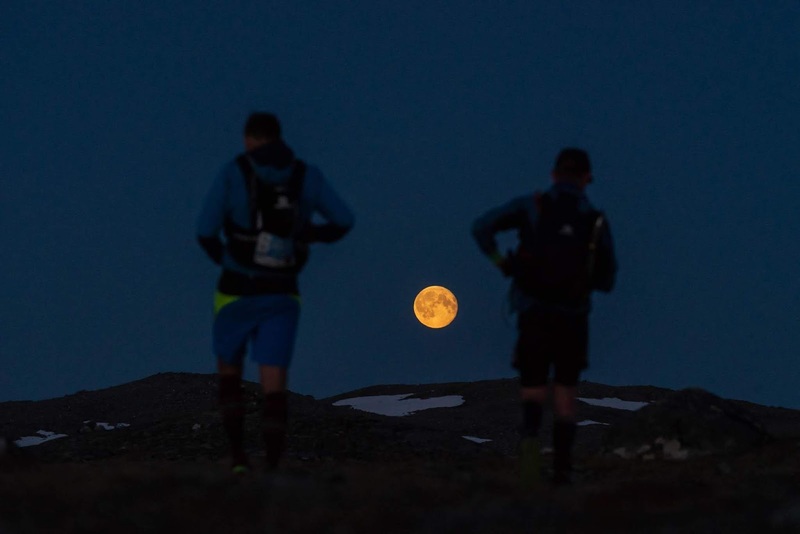 Running over 100 kilometers sounds impossible if you think about it as a whole, so to make it happen you have to break it into bite-sized chunks, even if sometimes the only bite you can swallow is just putting one foot in front of the other. The climb over Bjørnaskori seemed be never-ending. Although I ran with a three-man team for some ways, they soon disappeared up the trail ahead of me as I slowed to a crawl. At least the Hurrungane mountains were still visible, to be admired at different angle than earlier. I found my downhill legs on the next descent. I passed my friend Daniel, whose was having stomach trouble, and caught the three-man team. They were jokers, and my mode continued to improve as we ran together through the forest towards Vettismorki. The final section to the checkpoint at Vetti farm was a rather sadistic out-and-back. The trail dropped 350 vertical meters on steep switchbacks, which then had to be ascended after the checkpoint. We met the race leaders just as we entered to the out and back section, a quartet more than a hour ahead of us already. It would be the last time we would see them. 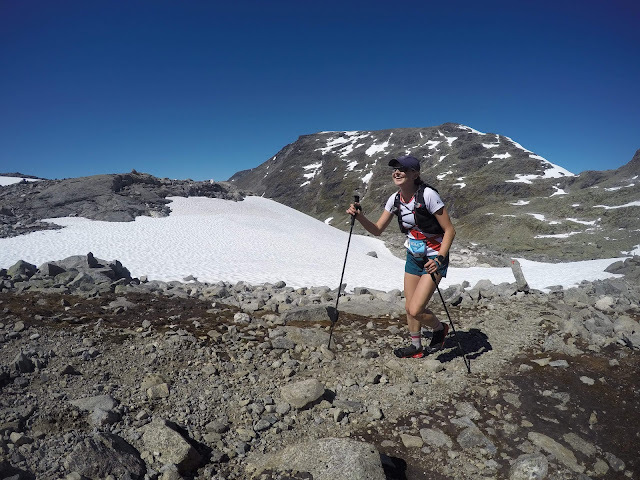 The descent was steep, and I got my poles out to avoid shredding my quads this early in the race. Finally, the trail spit me out of the trees into the heat and crowds at Vetti. I spent 15 minutes in aid, drinking wort and eating potato chips and cake as Audun dried my feet and changed my shoes and socks. He also knew the splits: The female race leader, Sylvia Nordskar, whom I had met as I descended, was 27 minutes ahead of me, while 2nd place Bettina had 15 minutes. I can work with that, I thought, I’ll keep playing the slow and steady game and see what the race brings. Lemon cake and fresh socks at Vetti farm. I was ahead of many of my friends by now, and met them as I climbed out of Vetti. Their high-fives and cheers provided a morale boost. After the fork, the trail quieted down and I found myself in a group with the trio, Roar, Bjørnar, and Jan Olav, whom I had met on the way down from Fannaråken. I had had a cough going into the race, and it was only exacerbated by the strain of the day. I had no choice but to pretend it didn't bother me as we headed into Helgedalen. Route-finding grew tricky as we moved up valley. There was no longer a trail, just red T marks sporadically painted on rocks through a mess of thigh-high bushes. We lost the ‘trail’ again and again, only to see other runners who would guide us back. We caught a male runner who, to my eyes, seemed to be fine except for a bad case of self-pity. “This is terrible, is the rest of the race only going to be walking?” he moaned. I pulled away from him as quickly as possible, not wanting his negative energy in my head. It was late evening by the time we began the climb out of Helgedalen, glad to have finally left bushwhacking hell behind us. I had messed up one of the connectors on my poles, and climbed, hands on knees, up the steep grade. The nice thing, I mused, was that seeing the whole valley behind me reminded me just how much forward progress I had actually made, even if it felt like I was moving at a snail’s pace. Golden light framed the mountains as the trail descended towards the next checkpoint at Tyinholmen. The others had pulled away now, and I was running with Bjørnar only, discussing the vegetation the beauty of the moment. 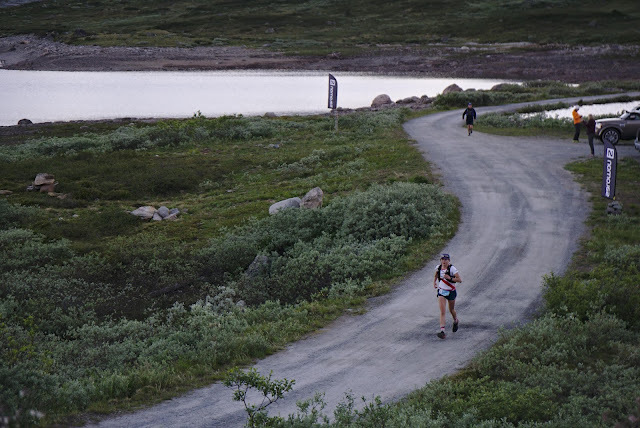 The final kilometers to Tyinholmen were on a runnable dirt road, and I was happy to feel my legs were fresh despite having covered around 60 challenging kilometers. I was right where I want to be at this point the race: fresh and not far behind the lead women. At the checkpoint, I picked up my MP3 player, changed into a dry, warmer set of clothes and fresh shoes, and ate an entire freeze-dried meal that Audun had prepared. There was a comfort in the fact that I had run the entire next section in training. It would be the longest stretch between two aid stations, but I was ready to go hunting through the night.